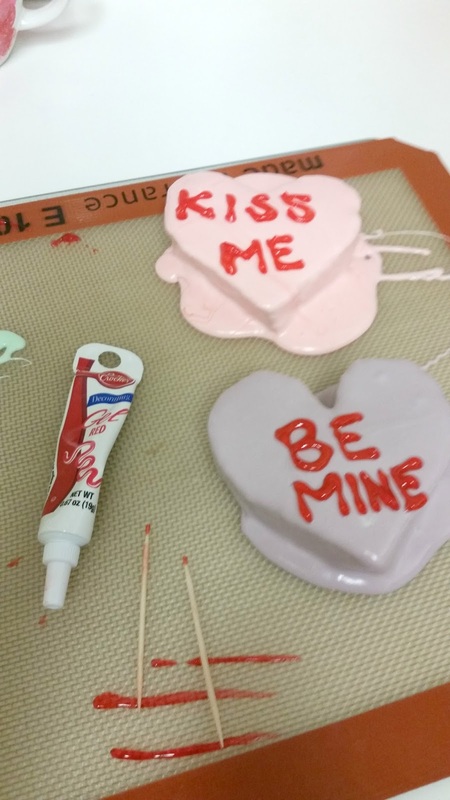 Looking for something to make for your man, your best girl friends, or your kiddos this weekend for Valentine's Day? 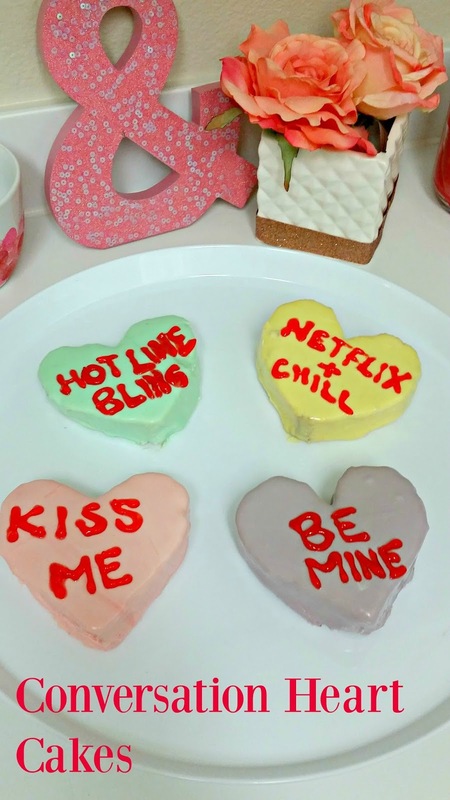 How about a fun twist on the classic conversation heart candy!? Now, you know me. Normally I am all natural, homemade, no artificial ingredients... you guys, screw it for these. Haha. 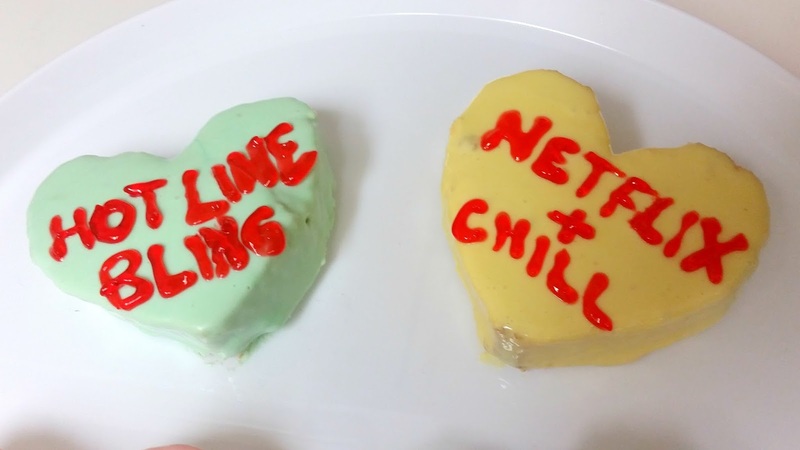 I bought pre-made cake, store bought canned frosting, food coloring, and red gel food coloring. Yikes. But they are so cute, and I wanted to make them quickly! 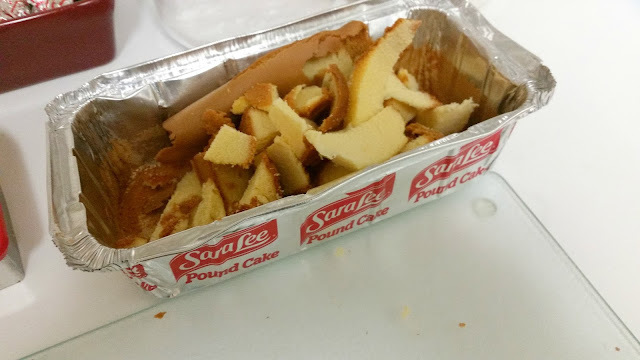 You can absolutely make a homemade pound cake, or any dense cake to use! Whip up your own frosting. And buy natural food coloring, or make some from: turmeric, berries or beets, blackberries or red cabbage, and spinach! Someday I will do a blog post on those! 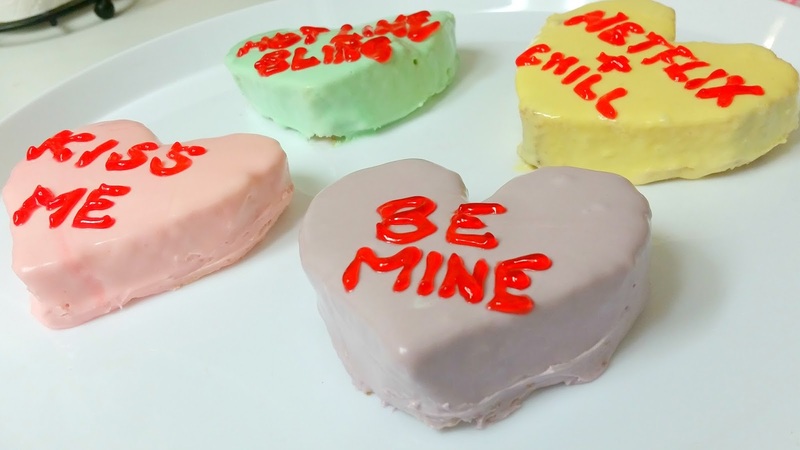 But until then, go pick up a tube of that red gel food coloring and let's make these! 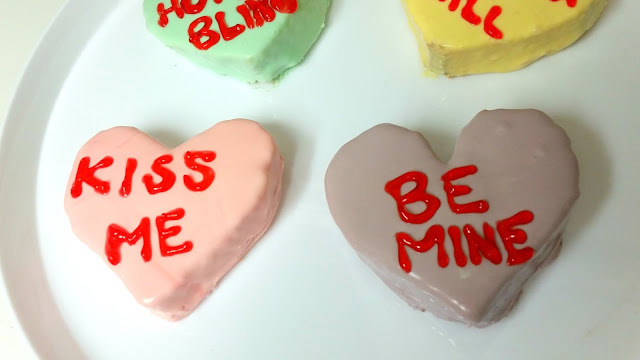 You can write whatever you want on these, too! 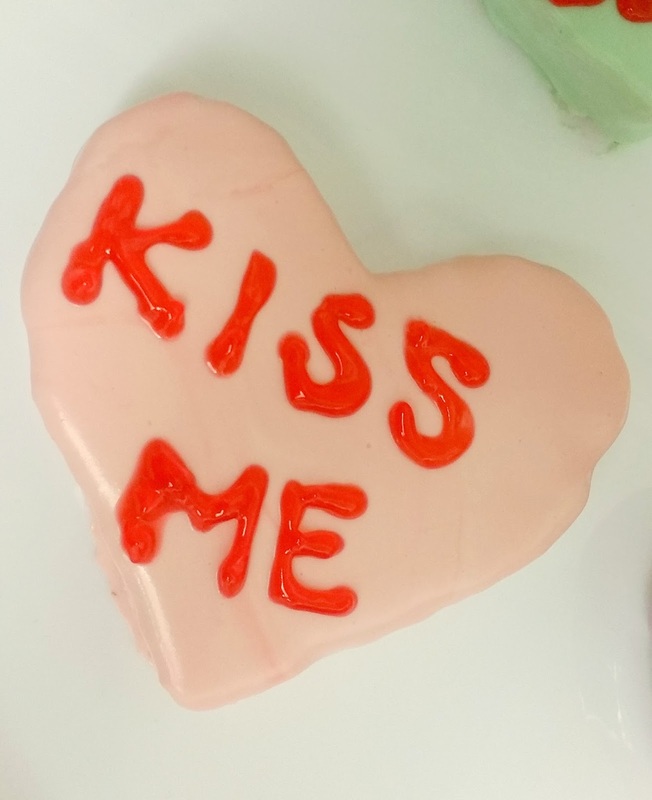 I Googled images of conversation hearts to get ideas of the classic ones, and then I added a few tongue in cheek trendy/funny ones, too! 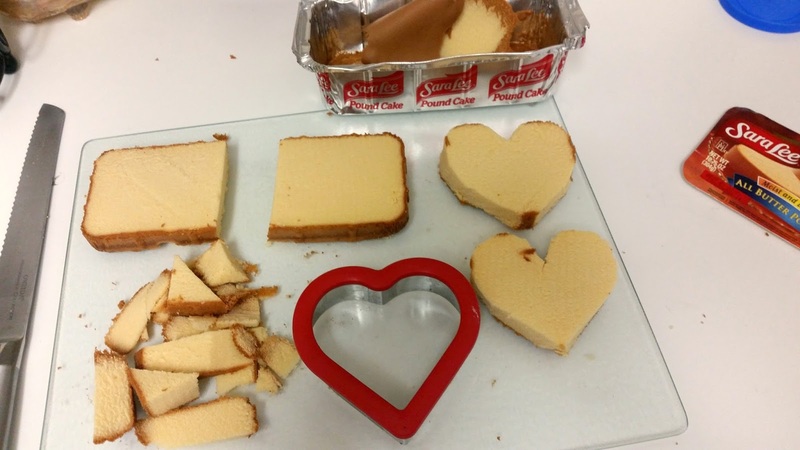 Heart shaped cookie cutter, stencil, or just use a sharp knife and wing it! 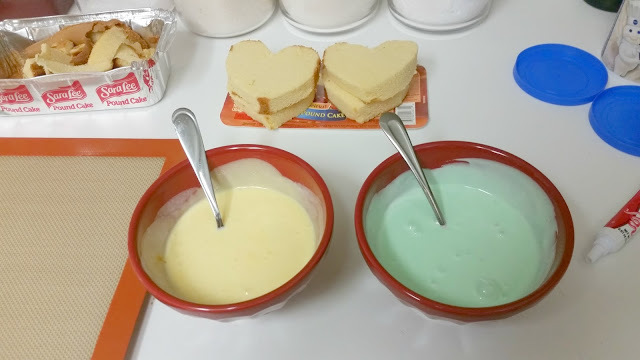 A bowl and a spoon for each of the 4 colors of frosting - bowls a little wider than your heart cookie cutter! 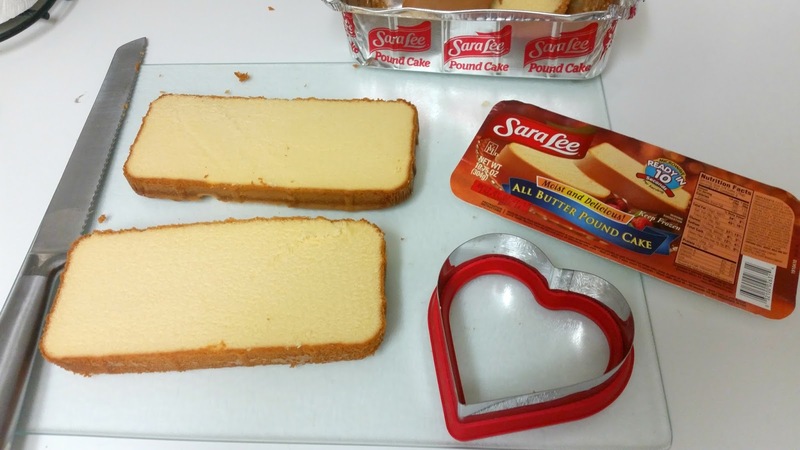 Cut the partially thawed cake in half the long way, so you have a top half and a bottom half. Then, cut each of those in half again the short way, so you have four pieces. Cut a heart shape out of each. 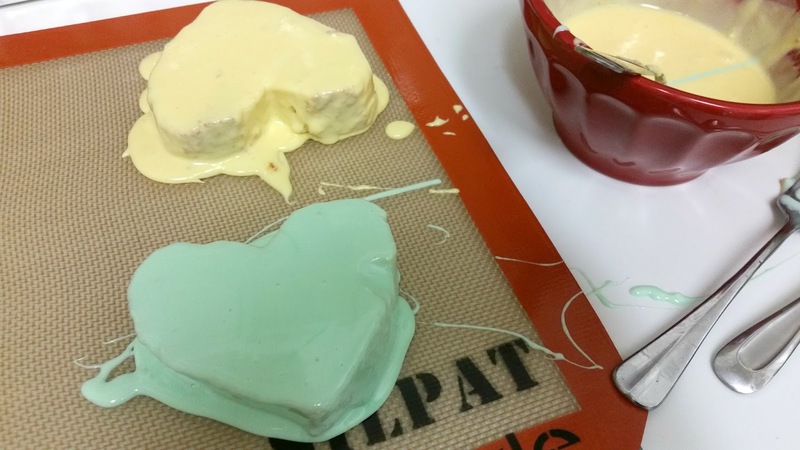 Discard the excess...actually, save it and dip into the leftover frosting like fondue! Woot! 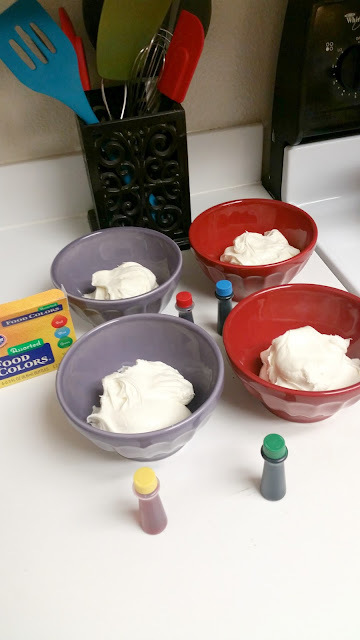 Put 1/4 of the frosting each into 4 bowls, and microwave in 15 second increments until soft and thin enough to dip the cake into. Add food coloring to desired shade, and stir well. I found I used about 4 drops of each color to get a pastel shade. More for purple, and less for pink. 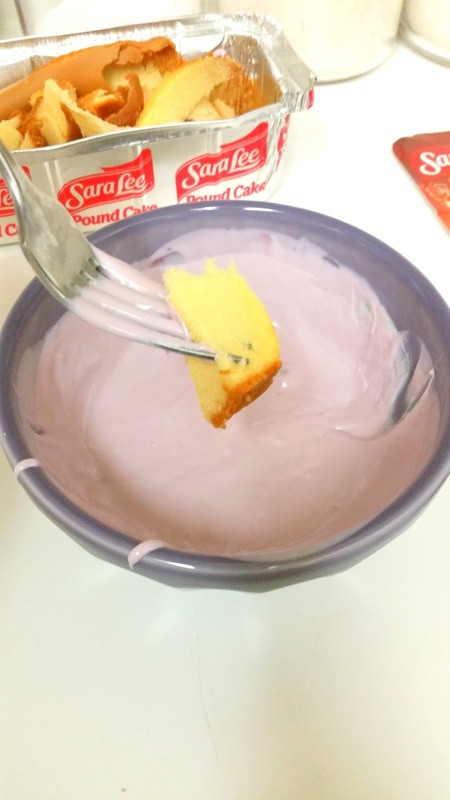 Using two forks, gently submerge one cake into each color frosting, working quickly so the cake doesn't fall apart, and trying to get an even coat all around. 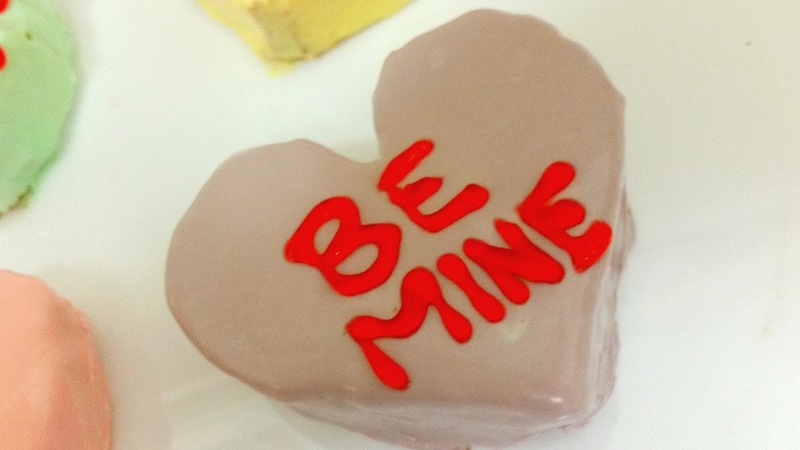 This is why you want the cake to still be very cold and firm. Place on a silpat or cookie sheet lined with parchment paper. Repeat with the remaining cakes. 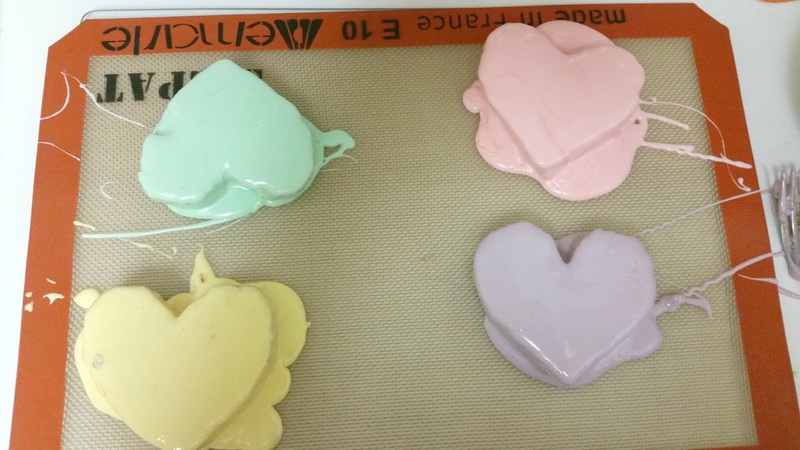 Place tray with the frosted caked in the freezer, or fridge, to help the icing firm back up. When the frosting is pretty set to a light touch, pull them out, and it's time to decorate them with little sayings! You can use a toothpick to help perfect the letters. I put them back in the freezer for awhile when I was done, too, to help set everything. Once set, these are then fine to store at room temperature. 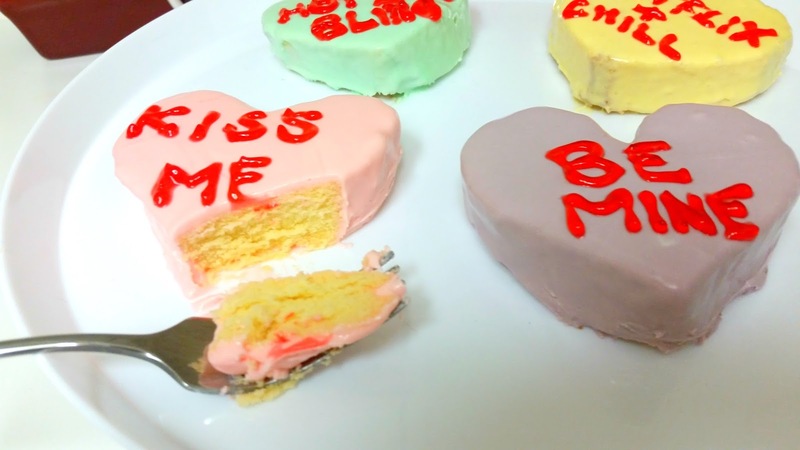 Christy's Kate Spade Themed Bridal Shower! Throw an Oscars Viewing Party!